EPS foa m is used extensively in the building and construction industry due to its high insulating value and resistance to the elements. Wall insulation, concrete block inserts, attic stair insulators and Insulating Concrete Forms (ICFs) are just some of the numerous building products made with EPS. In addition to their high R-value, EPS products help limit airflow into and out of a building, making it extremely energy efficient. 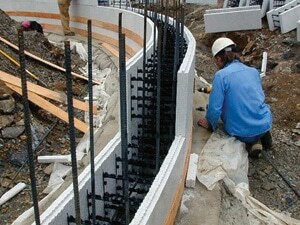 ICFs are walls of concrete with a layer of EPS foam on either side, providing numerous benefits. Not only are structures built with ICFs energy efficient, but the insulating value makes them peacefully quiet. Additionally, this building method provides exceptional durability; ICF structures resist the ravages of fire, wind and time. For more information on building and construction products made with molded foam call 508.234.6323 and ask for Sales, or Contact Us.